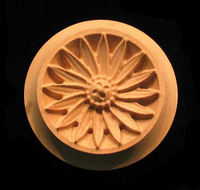 Carved decorative wood Rosettes, Corner Blocks, Medallions and Plinths are an easy and cost effective decorative wood accessory. They are often used to decorate window and door casework, cabinetry, range hoods and furniture. Carved wood rosettes are applied to flat surfaces while the carved wood corner blocks with integral carving replace mitered corners and therefor save you time too. All carved wood corner block and rosette art is created digitally and carved to order so it can be sized and custom carved any way you require and also added to other products on the site. Carved decorative wood Corner Blocks are an easy and cost effective decorative wood accessory used to decorate window and door casework corners eliminating the need for miters. They are also used as decorative ends to moldings or for the tops of pilasters and columns for furniture and cabinetry including fireplaces and range hoods. 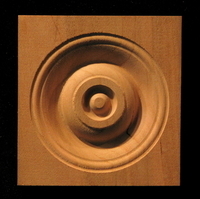 A variety of decorative carved wood round, square and oval wood rosettes from classical interpretations. 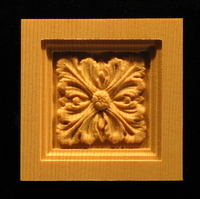 We can create custom carved styles for rosettes from any of the art seen in the catalog. Here is a sampling. Please inquire for custom requests. Capital designs are normally integrated in to the top of columns and pilasters. Here is a selection for your consideration. Plinth blocks are a simple device for placement at the bottoms of casing to intersect both the baseboard and casing. They are only lightly ornamented as they are in a high wear and tear area. Heartwood offers some simple designs but can also create period pieces to match your home's current style. 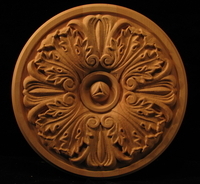 decorative wood carved corner blocks and rosettes period styles as well as tropical and nature carving.